What happens if I don’t train my pet? Without proper training, your pet won’t understand the rules of your home and what behaviors are and aren’t acceptable. This can cause your reactions to be confusing to her, making it much harder for you to form that all important bond between you. Veterinarians agree that training is an essential component for a happy and harmonious life with your pet. There are several different types of training that you will want to undertake. Ideally you should already have a firm idea of what the rules will be for your pet, and everyone should be aware of them and in agreement. This helps with the most important element of the training process – consistency. If there isn’t consistency in what you allow and how behave, your pet will become confused and training will fail. Toilet training. You may be fortunate enough to have a pet that has already been potty trained. Nevertheless, you will still have to show your furbaby where she is supposed to be going. If she is a cat using litterboxes, these will need to be placed in a fairly quiet, but warm part of the house. Bathrooms, offices and utility rooms are ideal. You will need to show her where these are and make sure she is happy with the location and the type of litterbox and litter that you have chosen. You will soon figure out if she isn’t as she will refuse to use her new toilet. If you have a dog, you will need to show her whereabouts in your yard or garden you would like her to relieve herself. Don’t leave her outside unattended as this could frighten her. If she has a bowel movement somewhere else in the house or garden, pick it up and place it in the correct area where you would like her to go as she will associate the smell with the space in which you have placed it. Responding to basic commands. This could include commands such as her name, sit, stop and drop. These can be crucial to keeping her safe, particularly in the case of dogs when you go out on walks and hikes. By training your pet her name, you can encourage her to come to you when called, while commands such as ‘stop’ and ‘drop’ could get her to put down something that she is eating that she shouldn’t be. Since pets can be unfussy when it comes to what they eat, this could prevent her from consuming something toxic. Crate training. This is often used to confine dogs to one area while toilet training is taking place. It can also be beneficial for owners who wish to restrict where their pet can go when they aren’t at home. Despite many people believing that crates are cruel, provided you get a crate that is large enough for your pet to comfortably lay down, stand up and move around, there is no reason why she cannot spend a few hours at a time in there. Make sure you place her favorite blanket, toy and food and water inside and you will almost certainly find that after she is crate trained, she will happily stay inside for short periods of time. 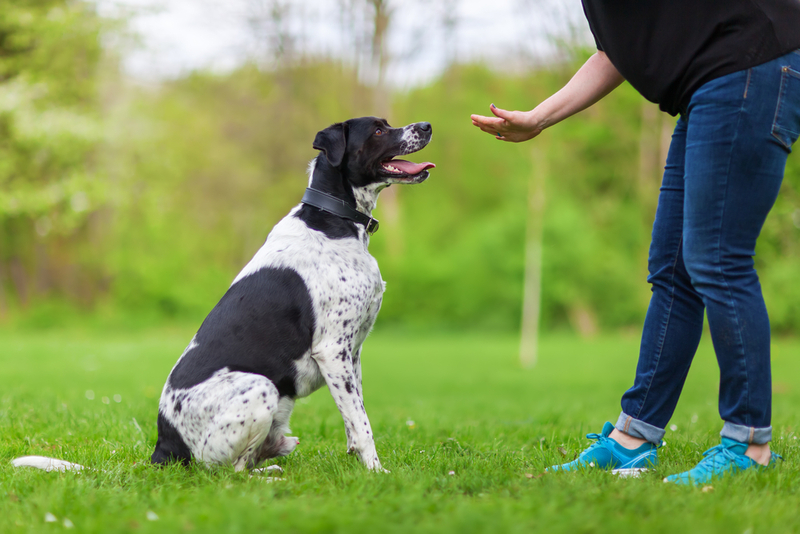 Dog training classes represent a different way of training canines. They are a valuable tool for learning socialization skills which enable dogs to be able to safely interact with other animals and people around them. A socialized dog becomes a confident, friendly, calm and happy canine who is fun to be around. Ask our veterinarian for recommendations for dog training classes near you. If you would like to learn more about the importance of training your pet, please don’t hesitate to contact our knowledgeable veterinary team.